Participate in the Hamster Hideout Forum! The latest news, and views, at the brand new official Hamster Hideout Blog. The HH Gallery has tonnes of adorable hamster pictures. 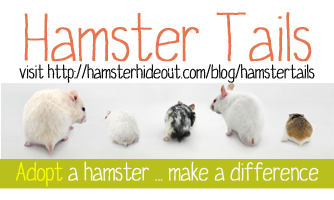 View the links and resources page for more hamtastic hamster links! More fun everywhere! Don't miss out on the fun, join the Hamster Hideout Mailing List! Be updated when this site is! Copyright ©2000- HamsterHideout.com. All rights reserved.